Miltoncontact: UK and Scotland replay EU and UK? A plucky nation wants to go it alone from a larger union that it feels cramps its style. Today it is Scotland versus the wicked Westminster Parliament of the UK, the latter angling to force a decision at a time that would be more in the unions favour than Scotland's. Just a month or so ago, the UK was playing the same role as Scotland against the Eurozone which was trying to push through its decision. From the chart above it is apparent that, based on figures alone, Scotland's departure from the Union would not necessarily be fatal. 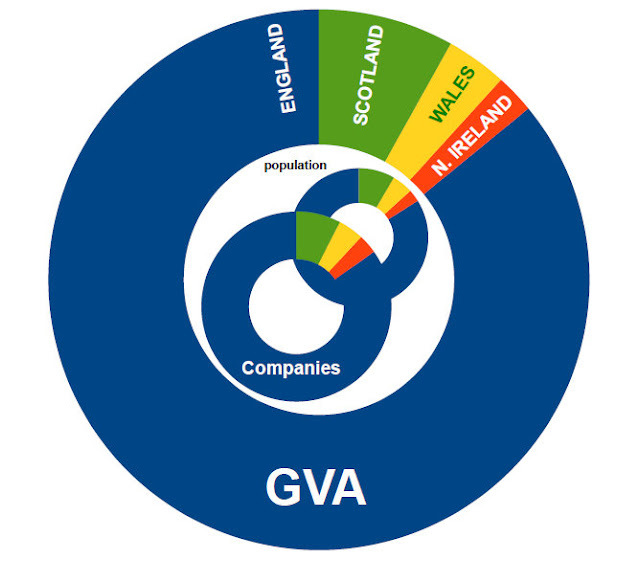 After all, Scotland accounts for 1/10th of the UK in population, number of businesses and GVA. Of course, politically and culturally it would be lethal - which Prime Minister wants to be the one at the breakup of the Union. Even worse - how do you face the Queen! The UK leaving the European Union, as a more significant economy, trading partner and financial contributor would be traumatic too. However, when I listen to local radio again here in East Anglia, which as a region is at least equivalent to or even outperforms the Scottish nation, I bet there will be voices piping up to the tune of Flanders and Swans about the merits of the English (http://www.youtube.com/watch?v=1vh-wEXvdW8) and going it alone. Chris - what really grates with me is that I am Scottish and have always worked for UK national organisations - RAF, Stock Exchange and Royal Mail but I am being completely dis-enfranchised by not being given a vote on this matter. I haven't taken on English nationality - even if that was possible. Every time Alex Salmon mentions "the Scottish People" I get so incensed. The UK Government announcements today were well considered and very welcome. I want a vote on this - I am Scottish !! Richard, I understand your frustration. I'd recommend writing to Alex Salmond directly - he does answer. In the broader view, I cannot see any benefits in fragmentation into ever smaller units. To survive on today's international world stage you need to be linked in with larger groups, whether nations or groups of nations. Whit IS important is the ability to influence local issues directly - and to avoid over centralisation. The big irony is that when I facetiously suggested East Anglia seeking independence (similar size and economic clout to Scotland and larger than Ireland)on the local radio FB page, there was a strong positive response!